(Bloomberg) -- Jaguar Land Rover plans to slash 4,500 jobs worldwide, as the U.K.’s biggest automobile maker responds to the sales slowdown caused by Brexit, flagging demand for diesel-powered vehicles and a downturn in China. The cuts, representing roughly 10 percent the company’s workforce, are part of a 2.5 billion-pound ($3.2 billion) push announced last year to reduce costs and boost cash flow through 2020. They come on top of the 1,500 people who left the company in 2018. The restructuring was announced on the same day that Ford Motor Co. said it would cut thousands of jobs in Europe. 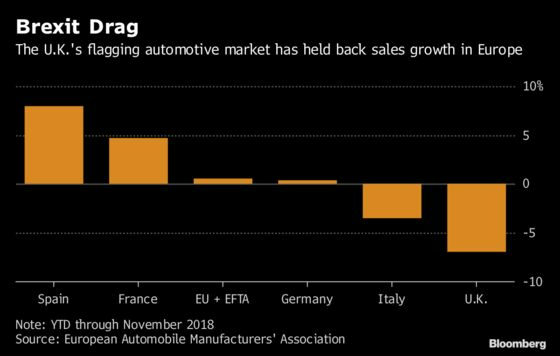 Jaguar, a symbol of British carmaking, and Ford are both vulnerable to a U.K. market that tumbled the most in 2018 since the depths of the financial crisis. That could get worse in a hard Brexit, while carmakers across the globe grapple with a downturn in China and pressure to invest in electrified and autonomous cars. Brexit played an indirect role in the decision, Jaguar Land Rover Chief Executive Officer Ralf Speth said on a conference call, citing the U.K. automotive market's 6.8 percent drop in 2018, the worst since the financial crisis. He said the company has limited capacity to stockpile parts to prevent disruptions in the case of a hard Brexit, given it turns out 3,000 vehicles a day. ``We build even more engines, so we need about 25 million parts per day and stockpiling that amount is difficult,” Speth said. Jaguar Land Rover said earlier that its retail sales fell 4.6 percent in 2018, citing uncertainty surrounding Brexit, the trade-war driven Chinese slump that lowered its sales in the country by 22 percent, and consumer misgivings around the diesel engines that power much of its Land Rover lineup. Sales at the SUV-heavy unit, more than double the size of the sports-car business, declined by 6.9 percent last year. The job cuts announced Thursday will affect mostly workers in the U.K., including contractors, senior management, supervisors, engineering, and design workers, according to people familiar with the matter who asked not to be named discussing details that weren’t announced. Production-line workers won’t be affected, they said. Jaguar, owned by India’s Tata Motors Ltd., employed more than 43,000 people during the 2018 financial year. The company said it would start a voluntary buyout program and implement a flatter management system as it increases investment in areas such as electrification. The automaker said its efficiency program, dubbed Charge and Accelerate, has already realized more than 500 million pounds in savings and improvements. The company said it will produce next-generation electric motors at its engine plant in Wolverhampton, and assemble batteries at Hams Hall, also in the U.K.’s West Midlands region. In June, the company said it would move production of the Land Rover Discovery sport utility vehicle to Slovakia from Birmingham, England, to make room for future electric cars. That move will cost 1,200 jobs. Jaguar Land Rover also froze production at an engine factory in the English Midlands, affecting 500 workers, for two weeks in December, citing slower demand.